It’s pretty safe to call a brand “All American” if they started almost 90 years ago and are still going strong. 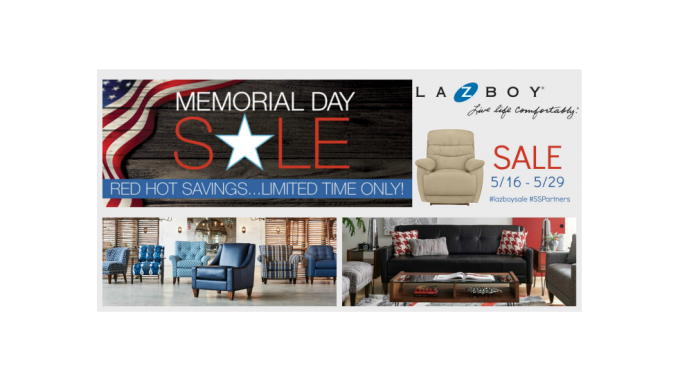 If you are shopping for living room sofa sets, it’s a great time to take advantage of La-Z-Boy’s Annual Memorial Day Sale happening 5/16 – 5/29. The savings are BIG! It’s not a surprise that La-Z-Boy is the world’s leading manufacturer of reclining chairs. However, they are also one of the nation’s largest producers of upholstered sofas, loveseats, chairs, and ottomans. This will help with finding any furniture need. I am currently in the market for a new house so I have been keeping my eye out on great furniture sales to fill up some of the new space I will have. I am finding that now is a great time to shop great deals on sofas, recliners, side tables and more during this La-Z-Boy’s Annual Memorial Day Sale. One of my favorite things about La-Z-Boy is their 3D Room Planner. This program allows you to design the perfect room. In just minutes you can create, redecorate and rearrange your room all with the touch of your finger or use of your mousepad. I love how you can customize furniture and fabrics, move them around the room. You can add the actual dimensions and specs of the room, add wall color, even the flooring. I like that I can share pictures of my ideas with my family and friends. It’s really super easy. La-Z-Boy is offering great discounts on home décor. And did you know that you can get special financing on sofas, loveseats, bedroom sets and more? The sale will end Monday, May 29th. Take advantage of the 0% interest for 36 months on purchases made on your La-Z-Boy Furniture Galleries credit card between 5/16 – 6/05. Further details can be explained at one of the locations. Hey Buddy!, I found this information for you: "La-Z-Boy’s Annual Memorial Day Sale". Here is the website link: https://www.trippinwithtara.com/la-z-boys-annual-memorial-day-sale/. Thank you.